Product prices and availability are accurate as of 2019-04-14 02:38:38 EDT and are subject to change. Any price and availability information displayed on http://www.amazon.com/ at the time of purchase will apply to the purchase of this product. 36108E Features: -Chrome-plated brass for greater durability. -Offers a snap connection. -Low lead which complies with the reduction of lead in drinking water act. -Easy installation. Application: -Kitchen faucet/Kitchen sink. 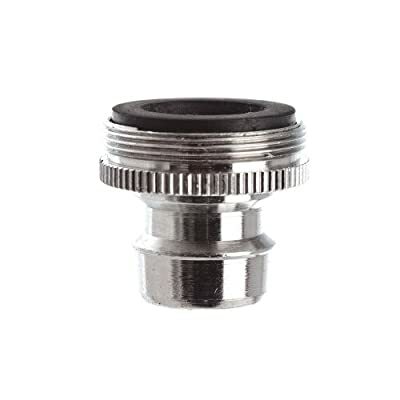 Product Type: -Adapter/Connecter. Finish: -Chrome. Dimensions: Overall Height - Top to Bottom: -4. 13". Overall Width - Side to Side: -1. 63". Overall Depth - Front to Back: -1". Overall Product Weight: -0. 06 lbs.